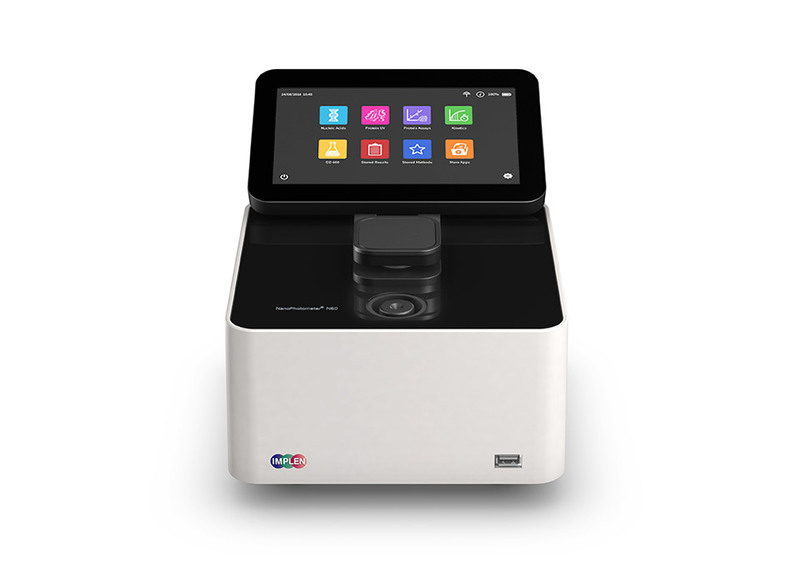 Best in class microvolume spectroscopy with the convenience of a lightweight portable instrument with a built-in 7 inch LCD glove compatible touchscreen with flexible unit control options. Built-in vortex provides sample uniformity of homogenous samples for the highest degree of accuracy with the smallest sample volume with as little as 0.3 µl. Illuminated quartz sample surface allows for easy sample application. 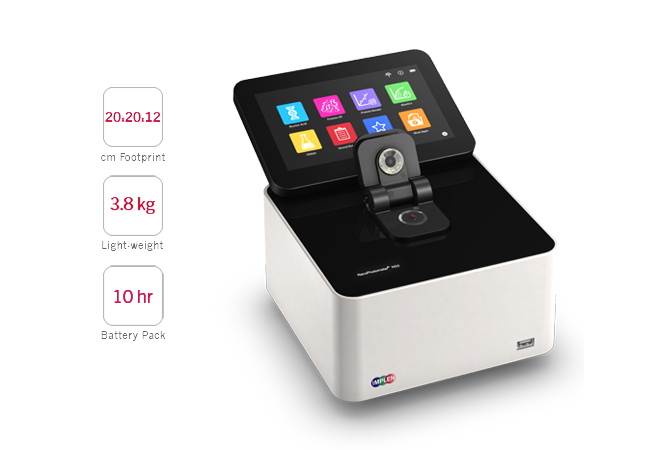 Microvolume spectroscopy can now be taken anywhere in the small light-weight size of 20x20x12 cm and between 3.8 to 5 kg depending on configuration. Mobility is redefined with an optional built-in battery pack for up to 8 hours of stand-alone operation. No computer required. 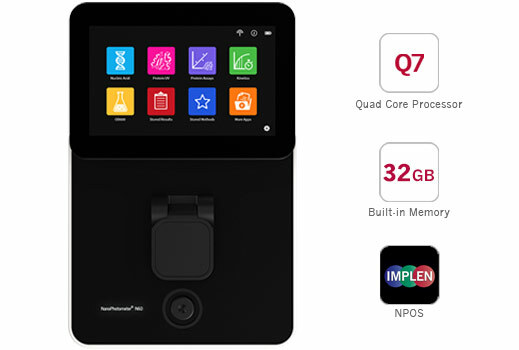 Built-in Computer with high performance quad core Q7 1 GHz processor and 32 GB of onboard memory provide powerful and easy storage of methods and data. Sample Compression Technology™ provides unmatched precision and accuracy with reliable measurement geometry of challenging samples including proteins. A capillary film is formed between two quartz surfaces with each sample eliminating the need for surface tension. Sample Control™ - the leading edge quality control technology to identify air bubbles, sample impurities, turbidity, lint residue and potential contaminations. Sample Control™ monitors handling characteristics and sample quality in real time to ensure that the measured concentrations are reproducible and most precise. Equipped with Wi-Fi, built-In HotSpot, LAN, HDMI and USB A/B interface connections for remote instrument control, data accessibility and printing. NPOS now supports AirPrint /IPP compatible printers supporting PDF format, printers compatible with the HP universal driver and DYMO label printers (cryo and standard labels). The NanoPhotometer® is compatible with 1 and 2D bar code readers allowing for flexible and streamlined data entry. 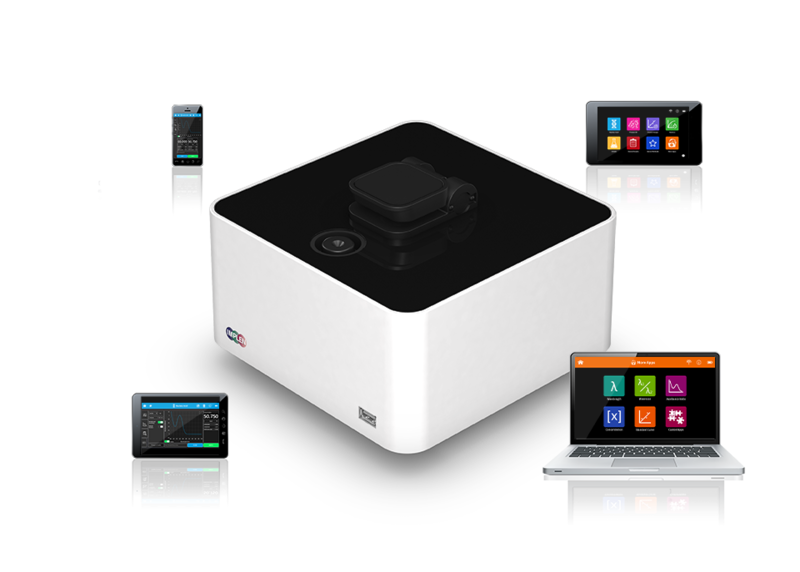 Unique file server functionality allows access of data stored on the NanoPhotometer® drive from any computer accessing the lab network. Every NanoPhotometer® is able to generate formatted Excel and PDF document files for data processing or archiving of measurements on the lab network. The capability to print full page reports, labels and cryo labels via USB and through a network connection lends users the upmost flexibility for data output. Supported printers include AirPrint/IPP compatible printers supporting PDF format, printers with HP universal printer driver capability and DYMO label printers. Malware, viruses and ransomware are serious threats to instrumentation working on Android or Windows based platforms. The proprietary NanoPhotometer® Operating System NPOS protects data in a secure environment immune to known malicious software. Whether running Apps on the NanoPhotometer/control device or downloading precious measurement results, your data is safe. For additional security the NanoPhotometer® does not allow browsing on the internet whilst providing safe access to control devices like computers, tablets and smart phones. 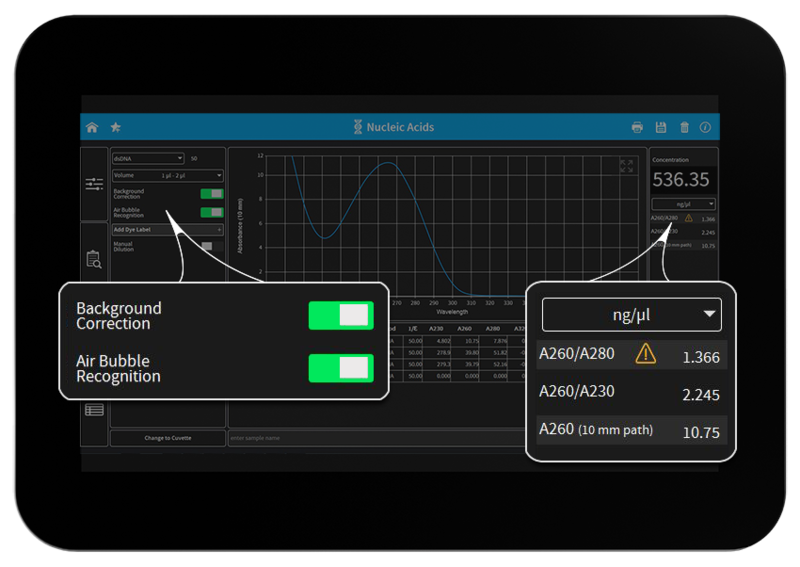 Mobile and easy control of the NanoPhotometer® is possible via Wi-Fi from tablets or smartphones (Android OS & iOS). 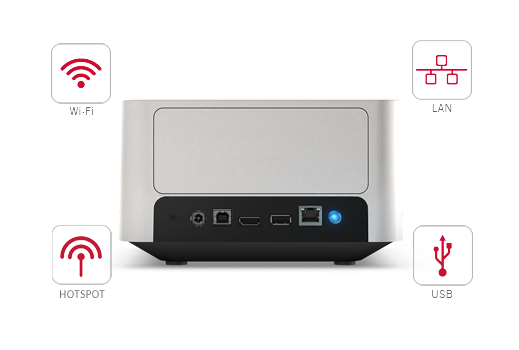 Easy control from PCs (Windows & Mac) with fast and flexible connection options including Wi-Fi, USB and LAN. 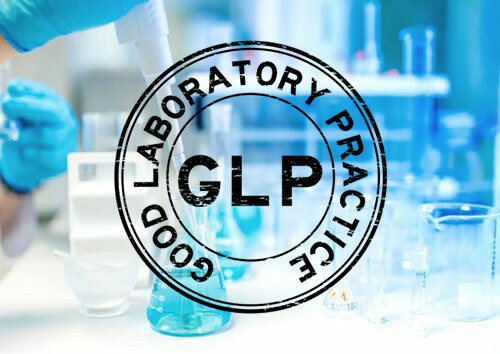 The CFR21 software complies with FDA 21 CFR Part 11 requirements and is an optional software tool ideal for GxP laboratories, which require proper electronic record keeping. It includes user management, access control, electronic signatures, data integrity, security, and audit trail functionality. Not available for the NanoPhotometer® N50. Turn on and instantly measure without lamp warm up time. 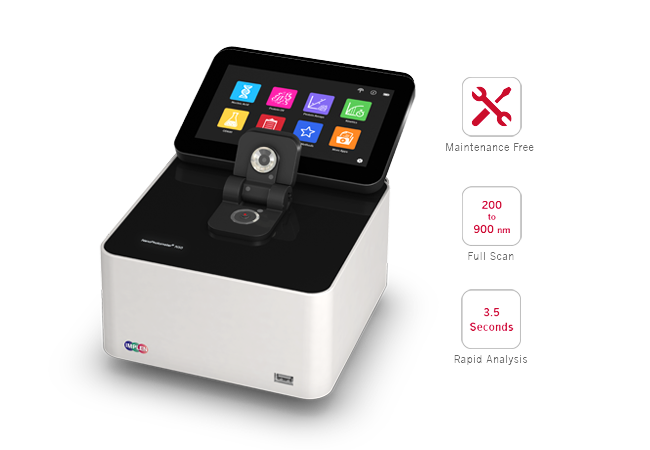 Full scan capability range from 200-900 nm (N50: 200-650 nm) for rapid and complete sample analysis in as little as 3.5 seconds (N50: 6.0sec). True Path Technology™ covers the extensive dynamic range with two precisely defined path lengths. The sealed mechanical setup has two fixed anchor points that are not changing over the lifetime of the instrument. No recalibration is necessary, Implen guarantees lifetime accuracy. NPOS now offers the user interface in a selection of languages. 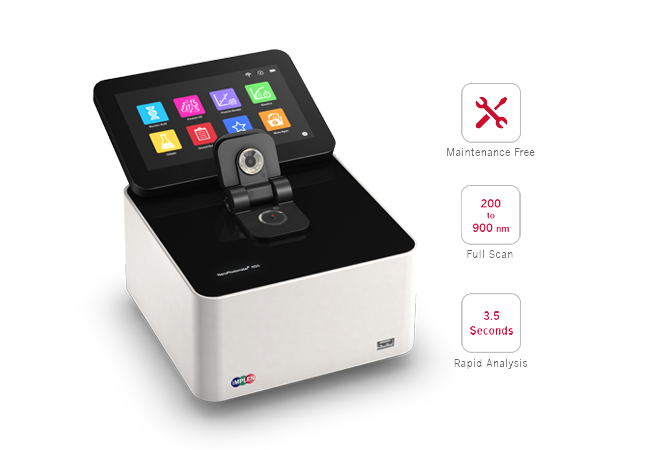 The advanced language functionality allows the operator to effectively understand and interact with the unit, boosting productivity in the lab. 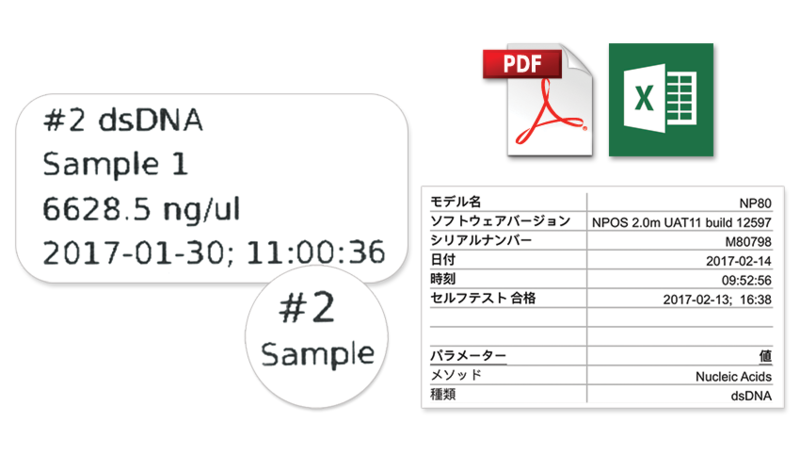 In addition to a new multilingual user interface, the NanoPhotometer® provides the flexibility to print results in multiple languages, which prevents misinterpretation of data and time consuming translations. The selection covers most widely spoken languages including English, Chinese, French, German, Japanese, Portuguese, Russian, and Spanish and will be continuously extended. 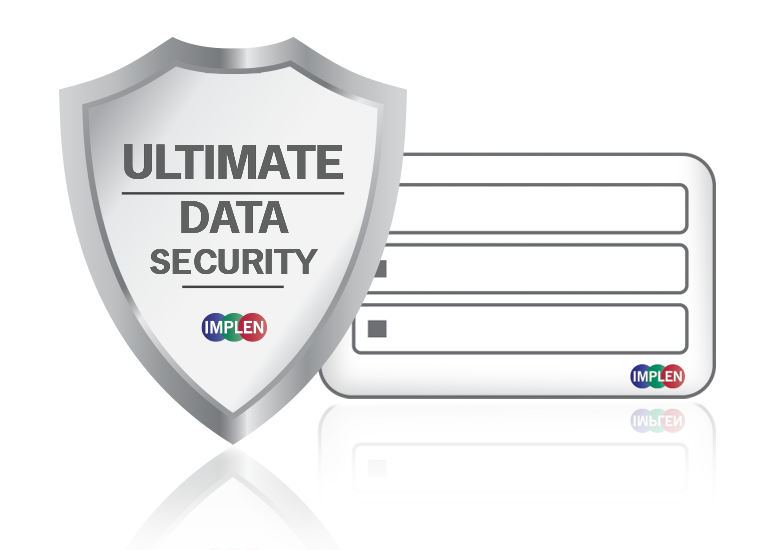 Be sure that your data are precise with Implen’s unique Blank Control™ feature. Blanks with high background or residues from previous users are the main cause for inaccurate readings. 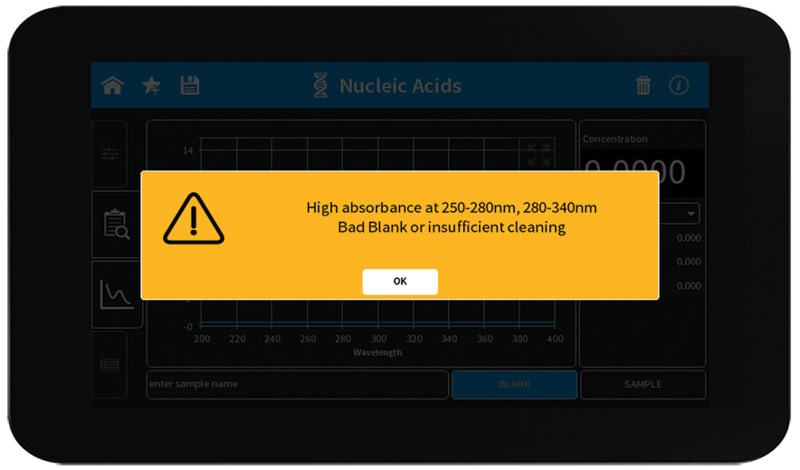 Blank Control™ will protect you from wasting time and precious sample on inaccurate readings caused by high background blanks or inappropriate cleaning. 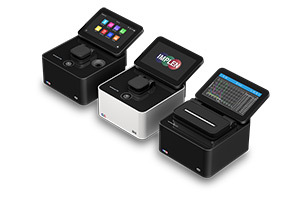 Which spectrophotometer is for you? Request a Free Trial for an in-lab demo of the NanoPhotometer®. Request a customized quote for any NanoPhotometer® here. The Implen Support Team is happy to help with any inquiry regarding Implen products.